Nongshim Chapagetti combines the taste of authentic Chajang with the ramyun noodles that we’ve all grown to love. The chajang sauce has the sweet taste of sweet onions, like any good chajang sauce. 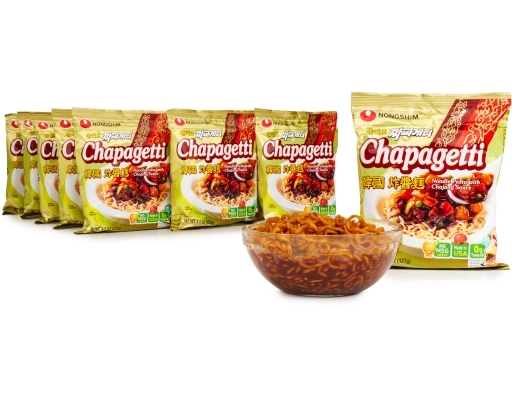 Carrot and meat flakes add to the meal, making Chapagetti perfect for whenever the craving for Chajang strikes. 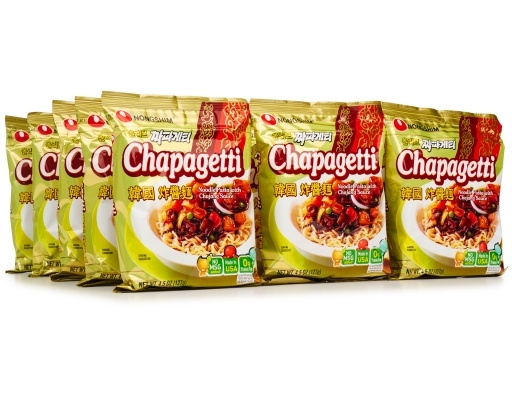 Popular extras include crushed chili pepper powder, and a side of yellow pickled radish. 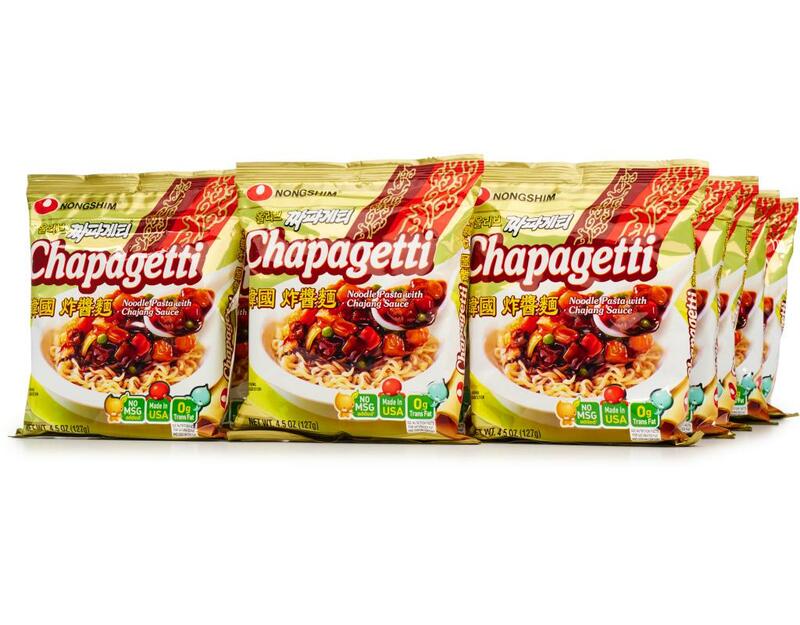 Chapagetti is Nongshim’s version of the Chajangmyun Noodles, an immensly popular noodle dish in Korea. Nongshim spent years developing and tweaking the secret Chajang recipe until it tasted just like the common Chajangmyun shops found all over Korea. 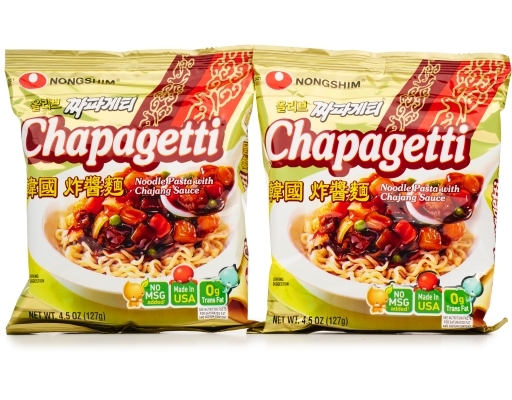 Making Chajangmyun is a very difficult process that few outside the business are able to do, but Nongshim Chapagetti makes it easy for you to enjoy the taste of Chajangmyun in your own home. Chapagetti is the fusion of Spaghetti and a Chinese black soybean paste known as "Chajang". 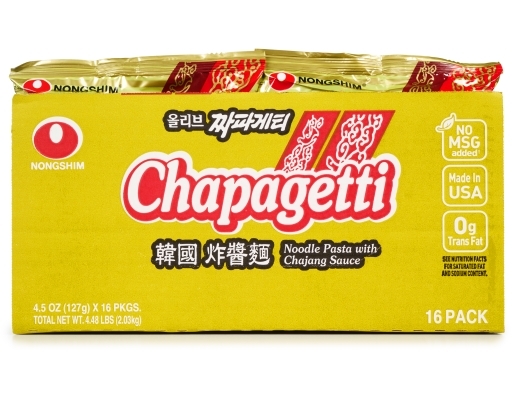 Noodles: One of the main characteristics of Chapagetti is the thick noodles that are reminiscent of the Chajangmyun dish. Nongshim takes great pride in the quality of its noodles, and carefully makes its noodles to be delicious, filling, and to match the character of each product. Granular Sauce: Nongshim’s special Chajang sauce just needs water. 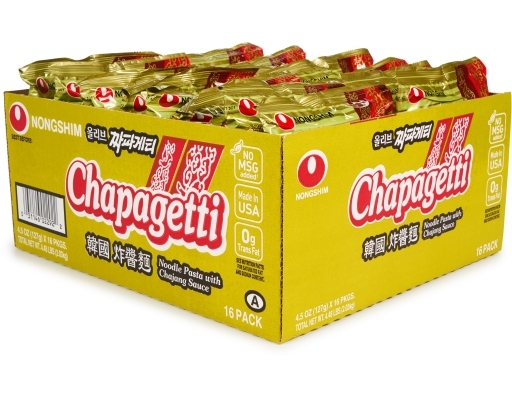 It was a challenge to produce a sauce that mixes well with water without clotting, but we’ve achieved just the right sollubility to give Chapagetti the right consistency to remind Chajangmyun lovers of the real thing. Flakes: Carefully selected Vegetable Mix has chunks of dried potato, onion, and carrots to go with our delicious chajang sauce. The flakes will make you feel like you’re enjoying a bowl straight from the noodle shops of Incheon. 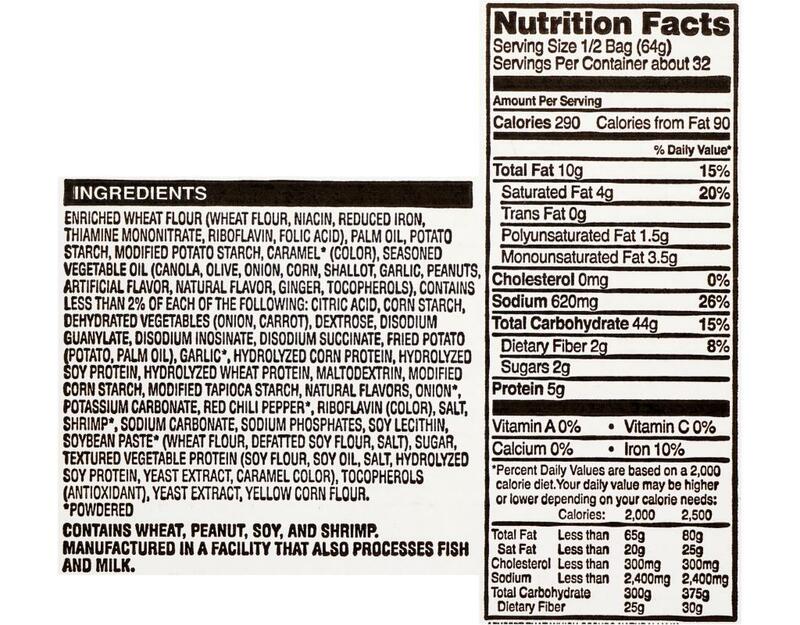 Enriched Wheat Flour (Wheat Flour, Niacin, Reduced Iron, Thiamine Mononitrate, Riboflavin, Folic Acid), Palm Oil, Potato Starch, Modified Potato Starch, Caramel* (Color), Seasoned Vegetable Oil (Canola, Olive, Onion, Corn, Shallot, Garlic, Peanuts, Artificial Flavor, Natural Flavor, Ginger, Tocopherols), Contains Less Than 2% Of Each Of The Following: Citric Acid, Corn Starch, Dehydrated Vegetables (Onion, Carrot), Dextrose, Disodium Guanylate, Disodium Inosinate, Disodium Succinate, Fried Potato (Potato, Palm Oil), Garlic*, Hydrolyzed Corn Protein, Hydrolyzed Soy Protein, Hydrolyzed Wheat Protein, Maltodextrin, Modified Corn Starch, Modified Tapioca Starch, Natural Flavors, Onion*, Potassium Carbonate, Red Chili Pepper*, Riboflavin (Color), Salt, Shrimp*, Sodium Carbonate, Sodium Phosphates, Soy Lecithin, Soybean Paste* (Wheat Flour, Defatted Soy Flour, Salt), Sugar, Textured Vegetable Protein (Soy Flour, Soy Oil, Salt, Hydrolyzed Soy Protein, Yeast Extract, Caramel Color), Tocopherols (Antioxidant), Yeast Extract, Yellow Corn Flour. 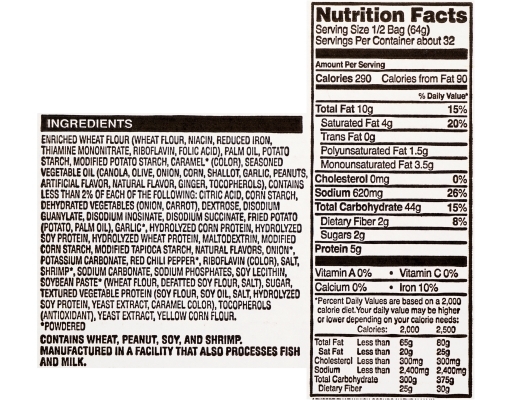 Contains Wheat, Peanut, Soy, And Shrimp.